GEMS, the Gulfport Extended MiniBus Service, provides safe, courteous, clean, reliable, and effective on-time service to the elderly and disabled residents of Gulfport. Trip reservations are taken on a first call, first serve basis. Be ready 15 minutes prior to scheduled pick-up time. Reservations may be made 10 working days before the desired travel date, but no later than 12:00 pm the day before your trip. Dispatchers are available to make your reservations Monday – Friday, 8:00 am – 12:00 pm. In order to accommodate as many riders as possible, pick-up times will be negotiated up to 15 minutes before or after the requested pick-up time. Cancellations MUST be made at least 2 hours prior to a scheduled pick-up time. Schedules may be affected by weather, road conditions, or other rider circumstances. The GEMS system is designed to provide transportation to Gulfport residents 55 years and older and disabled residents that are not able to use conventional modes of transportation. 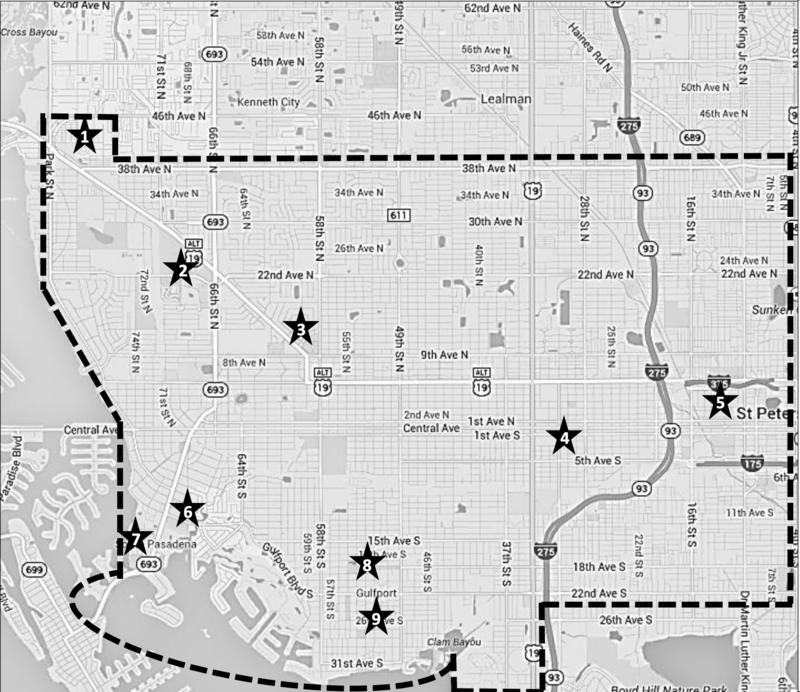 Anywhere within our service area which is: 38th Avenue North to 34th Avenue South and from Downtown St. Pete to the Intercoastal Waterway. Medical, social service, work related trips as well as shopping, dining and entertainment trips. Service area is subject to change. Fee Trips to the Gulfport Multi-purpose Senior Center are FREE! Correct fare is necessary when boarding the vehicle. Limited scholarships are available with proper verification for low income residents. Reserve early. Up to 10 working days prior, but no later than 12:00 pm the day before your trip. Limit shopping bags to a reasonable amount that the driver can carry in one trip. Target, Wal-Mart, Kohl’s, Ross, Total Wine, Petsmart, Subway, Cody’s, Harold Seltzer’s Steak House. Tyrone Square Mall, Best Buy, Home Goods, Home Depot, Bed, Bath & Beyond, Michael’s, Jo Ann’s. Doctor’s offices, Winn-Dixie, Big Lots, Hear USA, Vision Works. YMCA, Wal-Mart, Goodwill, St. Vincent de Paul Thrift Store. Edward White Hospital & Doctor’s offices, St. Anthony’s Hospital & Doctor’s offices, Bayfront Medical Center. Pasadena Area: Publix, Winn-Dixie, Wal mart Neighborhood Market, Dollar Tree, Doctor’s offices, Bank of America, Wells Fargo Bank, Quest Diagnostics. Gulfport Area: McDonalds, Sav-A-Lot, Wells Fargo Bank, Regions Bank, Walgreens, Doctor’s offices, Tuesday Morning Fresh Market, Post Office, Beauty Shop. THE GULFPORT MULTI-PURPOSE SENIOR CENTER.